Home > Clicktale > Website errors lower KPIs, ROI and revenues. Learn how marketers can strike back in this whitepaper. As web users, we encounter and are frustrated by website errors. As website owners, we understand that they annoy our customers, lower conversions, and negatively impact revenues. But as marketers, we tend to see web site errors as a sort of force majeure – something to be (hopefully) discovered, and then kicked down the line to be rectified. Today’s advanced marketing toolbox means that website errors are no longer beyond the reach of marketers. Today, we can not only discover them, but also evaluate their potential impact and prioritize remediation. Moreover, we can not only play a role in eliminating website errors – we can actually gain from them. The key to catching elusive website errors is simply to focus on the very people we work so hard to bring to our site and answer our calls to action: the users. 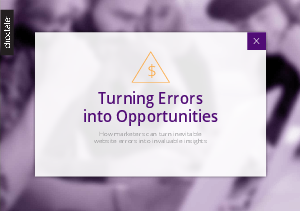 Marketers need to adopt a behavioral perspective about website errors. By focusing on what users are doing on our sites, we can catch common behavior patterns of user dropoff or abandonment that traditional tools simply cannot see. Once we find usability-related error patterns, we can pinpoint the errors themselves. Then, the actual impact of a given error on user experience and conversions can be assessed, its correction prioritized, and the usability and user experience takeaways evaluated. Once the exclusive domain of IT, a new generation of enterprise user experience solutions marketers can now play a direct role in website error identification and the prioritization of remediation efforts. In addition to ongoing efforts to correct and avoid errors, by examining individual user responses to errors, and adjusting our attitudes and tactics from reactive error fixing to proactive revenue and loyalty recapture, we can both recover the overall user loyalty and maximize KPIs.